Today’s guest post is from Biba Pearce at Your Novel Online. An e-book cover has an important job to do. Not only does it present your book to the world, but it also says a lot about you, the author. It can be a powerful selling and marketing tool, or it can damage your image as an author and lead to dismal sales. 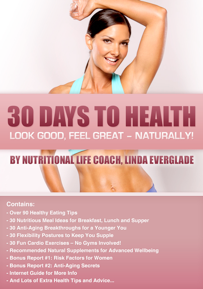 Here are 3 tips for creating a cover that helps you look your best. 1. Make sure it fits your genre and delivers the right emotional impact. Your cover image should entice readers who are shopping for a certain genre. Research bestselling cover images for your genre (e.g., mystery), as well as subgenres if needed (e.g., cozy mystery). The person buying your book wants to believe that the story or content will deliver exactly what they expect from the genre. So your cover image needs to enhance this in a positive way. 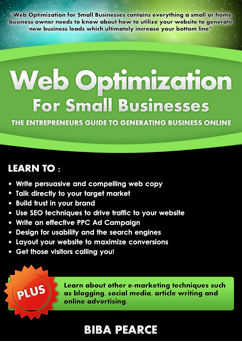 A book on web optimization, for example, should have a professional cover with a clear message that says, “You can trust me, I know what I’m talking about.” A thriller cover should probably offer a sense of intrigue, mystery, suspense, or danger. 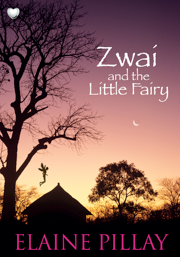 The cover image below is for a sweet African folk story. The designer has created a cover to appeal to readers of that type of story. For nonfiction covers, I recommend a design that is simple, yet eye-catching. A busy, colorful patchwork of a cover does more damage than good—especially if the text is obscured or hard to read among all the design elements. Aim for stylish and professional with one eye-catching image or feature. 2. Choose fonts that are appropriate, clear and easy to read. This is where a lot of amateurs go wrong. The fonts on your e-book cover should be clear and easy to read no matter how the cover might be displayed or manipulated. Consider how your cover will look in (1) large and small sizes and (2) in color or black-and-white. That goes for the title, the author’s name, and any additional information on the cover, including introductory text and bullet points. 3. List your name and qualifications. This is especially important for nonfiction authors. If you’ve written a book on weight loss then you need to support that by giving your credentials. What qualifies you to write this book? Are you a nutritionist or a doctor? Unless you are a celebrity, you have to prove why you are qualified to write on your topic. Also, a few well-placed bullet points on a nonfiction book cover will help point out what someone will find in the book. The trick to creating an effective e-book cover is to know your target market. That way you can gear the cover toward them and reassure them it contains exactly the type of information or story they are looking for. Bad cover design does your work a disservice and won’t convince readers to take a chance on you. While it’s true one shouldn’t judge a book by its cover, we all do. If you don’t have the skills to create a cover that passes muster in the market, then hire someone who can help you. Posted in E-Books, Guest Post. Biba Pearce has a background in web copywriting and search engine optimization. Her services at Your Novel Online include e-book cover design, e-book formatting, and site design. Totally agree. I hired someone to do mine. Another important factor is to make sure that cover doesn’t fall apart into pixels when displayed across all types of devices. They can really make it look amateurish. There is also where a professional designer is worth their weight in that glittery stuff. Totally hear you. Really depends on how that cover is being used and where. Definitely agree with your first point (tiny thumbnail). As far as the second point, I guess it depends on how imaginative you get. Too much imagination could confuse readers in your genre as to what they’ll be getting. If the design is a definite departure, then it ought to be deliberate and be attractive to the reader you want (e.g., the kind of reader who prefers their cowboys clothed). What tools would you recommend other than a word processor for creating a new eBook? You can also try Sigil -very good to prepare epub files. I disagree that bullet points should ever go on a book cover. It looks highly unprofessional and very tacky. I would never pick up a book with bullet points on the cover. EVER! Regardless of your personal feelings, traditional publishers as well as independent publishers would not consider it unprofessional for nonfiction. Would be honored to contribute! I’m planning to design some example ebook covers which could illustrate all possibilities. Maybe this would be a good idea to share?